Teens are honestly among the hardest to buy gifts for. They have outgrown many toys, and most of them aren’t into household items like cooking supplies and home decor items yet. But with these easy holiday gift ideas for teens, you can do all your shopping from the comfort of your own home. After all, it is fun to spoil them a little over the holidays and see their inner child come to life. They are still kids and should enjoy that magical feeling as long as they can. We receive small amounts of compensation from purchases made through these links which helps us to pay our writers. Thanks! It is a pain to juggle sunglasses, phone, and credit cards unless you have just the right bag. This is an adorable bag that can be worn as a crossbody or clipped onto a belt. It is available in dozens of different colors and patterns – OMG, cute and on Oprah’s list of 2018 Favorite Things. A plush blanket to add to the foot of the bed or use on the couch when watching TV with you (!) makes a great holiday gift for teens. This comes in more than a dozen colors – great for guys and girls. Teens love anything that makes their phone usage easier and these grips, that suction onto a phone or tablet, come in a variety of colors to suit any personality. These trendy bracelets are made by artisans all over the world. Through sales of their charity collection, Pura Vida has donated over $1.5 million to 174 non-profits. 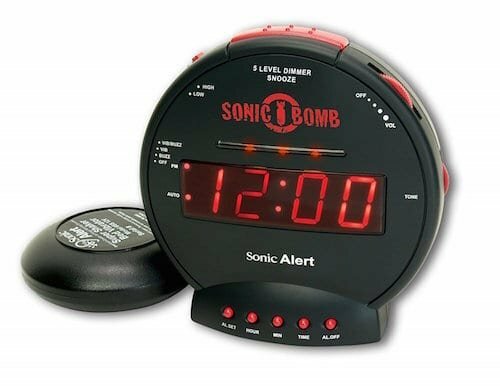 Is your son a heavy sleeper who snoozes through the alarm clock on his phone? Here’s one that will get him up and out the door so he never misses the bus, again. Loud sound, flashing lights and bed shaking capability is the ULTIMATE way to get him moving in the morning. No one wants a dead phone and this mini-charger can help your teens keep their phones with full charges regardless of how busy they are. Lightweight and can be thrown into a backpack, ready to power up a phone so your teen can call home – no excuses! We do not know of a cuter bluetooth speaker than this one. Incredibly compact, this one comes in four different finishes and is just the sort of thing your teen will throw in a backpack to sue whenever they need better sound than their phone can produce. Very well priced! Keeping a phone fully charged while on the go all day (and night) can be a challenge. We love this car charger that has room to plug in five devices so your teen and their friends can get the batteries on their phones charged up, super fast, all at the same time. This made it on Ophra’s List of Favorite Things 2018 for all good reasons. Being a teen is a magical time in a girl’s life and this charm bracelet will mark the occasion beautifully. And, since each bracelet is customizable with individual charms, no two bracelets will be the same! This is NOT your mother’s charm bracelet as Kendra Scott has just launched an array of very grown-up looking charms that your daughter will love. This is a game that has taken college campuses by storm. Super fun and a great workout. There is nothing like putting on a comfy outfit and spending quality time on the couch. Maybe you should get one of these super soft velour loungers that come in three sizes and three colors, too, so you can snuggle together while within your favorite show together. This is on Oprah’s Favorite Things 2018. 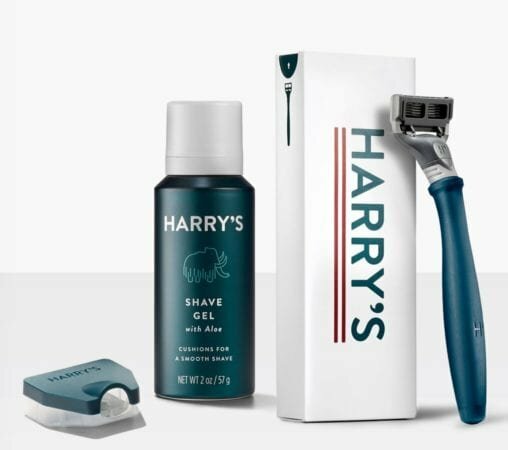 Harry’s will send your son a razor, shave gel and replacement blades at a frequency that matches how often he shaves. Harry’s now has face wash, body wash, lotion and some cute accessories to consider as stocking stuffers for the holidays. Let Harry be the reminder about good grooming, not you. Is your son a sports fanatic who LOVES a college team or one in the NFL, NHL, NBA, or MLB? He will be thrilled when he discovers this Fanchest box under the tree to with loads of great gear from his favorite team. NEW OFFER – take 20% off with code HOLIDAY20 THROUGH 12/24. Darn Tough are simply the best winter socks on the planet. They are indestructible and guaranteed by the company for LIFE. The colors are eye-popping and the thinner ones are great for everyday with boots and the thicker ones are perfect for hiking. We have walked countless miles in these great socks with warm cozy feet. Let them sing in the shower with Water Resistant Bluetooth Waterproof Shower Speaker. It has an extra strong suction cup and great sound, so it can literally go anywhere. It’s perfect to take along to the beach, or when you put them to work watering your perennial gardens. Herschel makes excellent backpacks, toiletry kits and wallets. These card cases are what some teens prefer to use to hold IDs and a credit card. No need for anything bulky. Lights not only make your kids safer as they are riding around the neighborhood, but they are super cool. These lights can go from “constant on” to “flashing mode” and are easy to install. They fit 12″ toddler bikes up to 29″ adult bikes. This lamp has a dimmer, bluetooth speaker, and turns on simply by being touched. And the best part is, it actually comes with a long-lasting battery that can be recharged. I love these cuff bracelets with empowering messages. My daughter wants a few of them to stack on her wrist. They come in a variety of metals and are a classic piece that will never go out of style – perfect stocking stuffers. 2018 is the year of “clout” at least if you are a teen. You earn major points by picking up these nifty glasses as a gift for your high school son or daughter. And protip: it’s goggles, not glasses. How fun is this? It’s a movie “scratch off” poster. It lists 100 popular movies of our time and, after your teen watches one of the movies, he can scratch off the box to learn a little bit of trivia about the movie. Perfect for that film buff on your list. is a fantastic book every teen girl should read. It’s a fun read, written by psychologist and teen expert, Lucie Hemmen. It not only offers tips to help your teen deal with difficult situations, it helps them get to know themselves a bit better, too. This is a great bag for your son or daughter. It’s rugged, can fit a laptop, and is perfect for every day use as well as traveling. There is so much to look at on those growing, changing faces. Whether they are getting glammed up for a party or just taking a close look at a freshly-washed face, every teen needs one of these personal mirrors for their bathroom. Beanies are in, and this one is super amazing with its built in wireless headphones that can be removed for washing. The hat also comes with a face mask for those extra cold days. They will have no excuse not to get out there and air out their shorts with this. Let’s face it, teens can be tough on things like watches. But this waterproof, digital watch is under $20 and can double as an alarm to wake them up for school in the morning so you don’t have to. Bath And Body Gift Set comes with everything you need for a home spa day. My daughter can’t get enough of these delicious smelling lotions and potions, and the best part is, she likes to share. It comes with floral smelling bath bombs, bubble bath, shampoo, conditioner and more. Best Gift Ideas for the 2018 Holidays Just For Fun!